LTH Home > Chat > Eating Out in Chicagoland > Libertyville eats? This Friday morning I'll be driving from my northside home up to the hinterlands of Libertyville to drop my car off for service. It _should_ be a relatively short (couple hours) of service, assuming I get there early enough to have my car be one of the first to be worked on. I'll be at Bernard's Chevrolet, 1001 S. Milwaukee. Any breakfast options nearby? Any noteable food, breakfast or otherwise, in case it runs longer and I take the train back downtown and return in afternoon/early evening? Really just looking for potential time-killing outlets other than the dealership waiting room, where typically a TV is blaring out something like Springer/Geraldo/Jenny/etc. Kman wrote: This Friday morning I'll be driving from my northside home up to the hinterlands of Libertyville to drop my car off for service. It _should_ be a relatively short (couple hours) of service, assuming I get there early enough to have my car be one of the first to be worked on. Thanks! Bagels by the Book sounds like a real winner. Yeah, since I'll be on foot (or PACE) I realize the scope of my area is rather limited, and I honestly don't have any familiarity with the immediate area. For those that wonder why I'm traveling all the way up there when there are a zillion Chevy dealers it's simple - trust. The 'vette mechanic there is very well respected and somebody I absolutely trust to do the right thing, and (sadly) it's really hard to find that these days. I will give back, though, and post my findings on any of the places I visit. Since I'll be dropping the car off when they open at 6:30-7:00 AM the steer to Bagels bt Book sounds like a real winner. Gee,Kman,we are anxiously waiting for that report!I pass through that area occassionally. 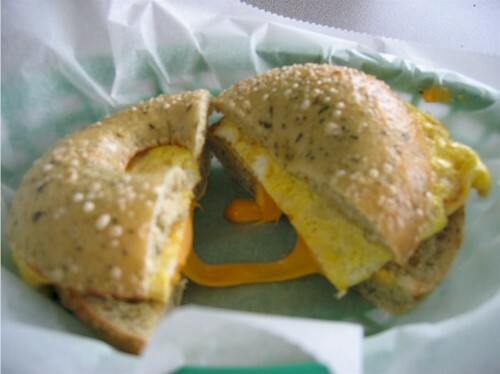 JiminLoganSquare has several times mentioned the quality of breakfast bagel sandwiches at Bagels by the Book in Libertyville. When he suggested it was even better than McDonald’s Steak and Egg Bagel sandwich, this really got my attention as I really love that sandwich. This morning came just a little too bright and early due to our with our longer days. Wide awake and nothing to do, I decided even though it was Sunday, an early breakfast in Libertyville would hit the spot. Just to get a broader picture, I invited my Mother and cousin to come along for the ride. 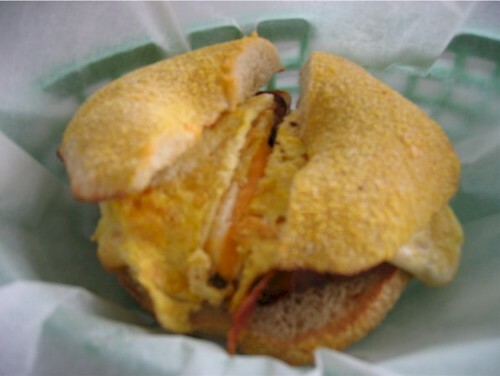 Before departing, I checked Jim’s recommendations for bacon, cheese and egg sandwich on a cornmeal or salt bagel. When I arrived they were down to the last cornmeal bagel and maybe a half dozen salt bagels. I scanned the menu, then decided to go for Jim’s favored combo on a cornmeal bagel, which I shared with my Mother who ordered a sausage variant of the same with the salt bagel. My cousin ordered an egg and cheese on a spinach bagel, which he said did taste of spinach. Their method of preparation is to toast the bagels, then cook the eggs like an omelet enclosing the cheese and put any meat on the bottom. This had the advantage of more cheese on your sandwich without it squishing out all over the place. I especially like the cornmeal bagel, which was firm and chewy, though my Mom found it dry. She had no such complaint for her salt bagel, which was just a bit moister from the fat in the sausage. She tends toward a dry mouth which makes her more sensitive than most. They also offer bagel lunch sandwiches such as pastrami, corned beef, peanut butter and jelly. This is a very nice find. Not destination dining, though I would certainly beeline when I am in the area. Thanks Jim for unearthing this for us. Ah, sweet validation! Glad they've kept up the quality at Bagels by the Book; I haven't been in over a year. As you say, Cathy, it's not a destination dining spot by any stretch (in Libertyville, that would be Tavern, Firkin and/or Bottaio). But it was always nice having them there when I lived there and, as Kman's original post suggests, it's a great spot to hit if you find yourself stranded on the Libertyville/S. Milwaukee Avenue automobile row waiting for a repair, etc. I had a day long meeting in Libertyville. It was a great opportunity to visit Bagels by the Book twice in one day. Breakfast was an everything bagel with an egg, bacon and Swiss cheese. Lunch was Boar's Head roast beef with tomato, lettuce, onion and mustard on an everything bagel. I had hoped they might have a horseradish cream sauce, but no dice. On both visits, I ordered my meal and then a long line gathered behind me. All my past visits were at sleepy times, so it was great to see this place supported by locals. Dang, right next door to where I get my hair cut. Never have gone in--now I'll have to. You know, right up the street from there is a weekly go-to of mine, a Hub's-ish Greek-tinged establishment named Fodrak's. BBQ half-chicken over Greek salad is a favorite for the carb avoiders. Best gyros in Lake County, moist and flavorful. What did they say on Seinfeld? "It's NOT fast food--it's good food served quickly!" I’ve had the gyro at Fodraks. It’s not bad. But I prefer Nikko's Grecian Grill. While Not in Libertyville, it is in Lake Country. 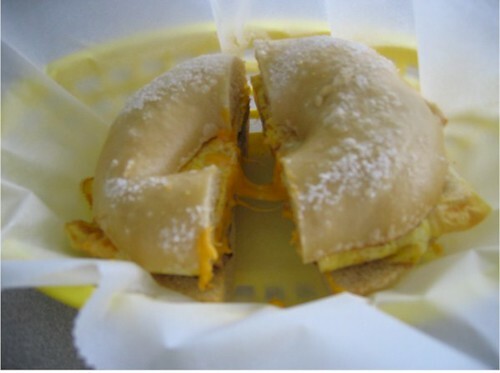 In May, the little 14-table shop sold 6,869 breakfast sandwiches as well as 9,374 bagels, the Daily Herald reports. Little said a disagreement between her and the landlord of the location is what led to her decision to not renew her lease and to close. She does not have any immediate plans to reopen elsewhere, according to the article. Maybe they can move to the shuttered Bahn Mi store? This thread caught my eye today. Visit Bagels by the Book soon. I read this morning that they will be closing soon after a long run. I want to recommend a great, fresh 1+ year old local spot that my wife and I both love. Their lunches and dinners are fantastic, and keeping with the theme of this thread, their breakfast is worth enjoying if in the Libertyville area, and just 4 or 5 blocks North of the mentioned Chevy dealership. I can't speak for evything on the breakfast menu, but do recommend both the cecina and eggs, and the chilaquiles. We do have a few go-to mexican restaurants, but dos amigos always tastes so fresh to us. It has a very local feel to it, friendly staff and owners, casual setting. Everything tastes made to order. While not on the menu, huevos rancheros are available if requested (when I inquired). As a side note, at lunch and dinner, they do charge for chips, but outstanding chips and guac are worth the cost. Drove past Bánh Mì Báguette in Libertyville to see a open sign flashing. I turned around to see for myself if this could possibly be true. IN the window was a sign stating, 'Opening Soon.' Inside there was a table full of people who were being served Bahn Mi. I walked into their very first day of operation since last summer. This place is owned by the same people who own Pho House. The only person behind the counter is a part owner of Pho House. The menu has expanded to at least a half dozen Pho bowls. They closed last summer because they were unhappy with the performance of the guy assigned to run it. They fully intended to open sooner, but they were occupied with the business at their other restaurant. I'd already had lunch, though I expect to be back sooner than later. As I left, they removed the 'Opening Soon' sign. Bert's Deli in Libertyville takes my vote. Ha ha! That was fun to watch. Thanks. Sorry, I still hold a grudge against Bert’s. I was there having a sandwich when the couple at the next table lit up. I complained and was told if it bothered me, there were tables outside. This was probably 20 years ago or so, can’t remember. But I do remember it was a State law at the time. Haven’t been back. The sandwich I had at Burt's Deli (the one time I was there) was paltry compared to the one in the video linked above. I wasn't wowed by the place in any way, and have never returned. Even living in Lake County, that was a long trip to make for food that was nothing special. The Smoke Free Illinois Act (410 ILCS 82; Public Act 095-0017) is a comprehensive anti-smoking law that took effect in Illinois on January 1, 2008, and bans smoking inside most buildings and vehicles used by the general public, used as a place of employment, or owned by the government or other public body. ronnie_suburban wrote: The sandwich I had at Burt's Deli (the one time I was there) was paltry compared to the one in the video linked above. I wasn't wowed by the place in any way, and have never returned. I totally agree. Burt's is nothing special. If I want good deli I will make the trip to Skokie for Kaufman's. Guess I got my timeline wrong. I know that at the time they kicked me out, the law was in effect. dodger wrote: Guess I got my timeline wrong. I know that at the time they kicked me out, the law was in effect. Either way, just brutal and not a feather in their cap. Stopped by last night for a quick Bánh Mì on my way to a meeting. The list of pho options has been taken down. It will return in a month. My Korean BBQ Bánh Mì was delicious and the roll crackly crunchy. Paper on the windows suggest they have finally given up on this place. Doesn't surprise me. It was ill-fated, a tiny (but clean) stripmall storefront that doesn't stand out on a very busy street, and whenever I've gone in--usually late afternoon--to grab a sandwich and iced coffee (whatacombo!) I've always been the solitary customer. As I may have said in a previous post, Cathy, this place was owned by the same folks that run Pho House, south on Milwaukee about a mile on the other side of the street. Vietnamese food is fair to good if we're comparing to similar establishments throughout Chicagoland, but for the far northern suburbs it is pretty darn good. And the banh mi sandwiches are sourced from the same vendors, so they'll be the same as the now-shuttered storefront. Since the topic is 'Libertyville Eats', however, I have found Curry Leaf, a Kerala-based Indian storefront on Peterson Road open for 4 months, to be reasonably-priced and very good. Have tried the chicken vindaloo, chana masala and palak paneer, along with a wonderful jeeri rice (jasmine with golden raisins & cumin). Only 3 tables and a counter, basically for carry-out. I'd like others to try Curry Leaf out to get more perspective.